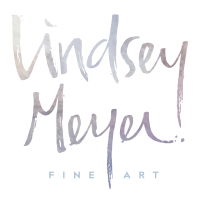 Lindsey Meyer is an abstract artist whose love for art spans back as far as she can remember. Her works are alive with rich color, texture and movement, valuing non-objective properties more than a recognizable image. Lindsey's greatest inspirations come from the relationships between color and space, as well are her roots in fashion, graphic design and interior design. She enjoys working mostly in oil and acrylic, but often moves in and out of other mediums within her painting process, enjoying the surprises that emerge along the way. Her work has warranted various shows throughout the south and can be found in private collections across the United States. Although raised in Arkansas, Lindsey has found her home in Dallas, TX where she lives with her husband, three children and teacup Yorkie.